A trip report from Talkin’ Birds Ambassador Candy Powell. Scroll all the way down to see the photos. The Venice Rookery in Venice, Florida is truly a sight to behold. During January and February for the past four years, my husband Chris and I have spent time at my cousin’s cottage in Englewood. We visit the Rookery each time we are here. Few words are needed, since the pictures speak for themselves. The Venice Area Audubon Rookery is located on a small island in a former storm water retention pond. For the past thirty years, it has been a roosting and nesting spot for more than ten species of water birds. Great Blue, Little Blue, Tri-colored, Green and Black-crowned Night Herons; Great, Cattle and Snowy Egrets; Anhingas, Double-crested Cormorants, and Glossy Ibis nest on the island. In addition, dozens of White Ibis fly in each evening to roost for the night. In the late afternoon, close to sunset, the show begins. Just when you think the “hotel” looks full, more birds fly in, often a dozen at a time. During the 2011 Christmas Bird Count, the Rookery had 720 overnight roosting birds! Several birds are on the island throughout day, but early and late afternoon are the best times to go birding. The island is about 50 feet from the shore of the pond. It offers birders and photographers an excellent view of birds roosting, sitting on nests, flying in with nesting material, vying for the best spot, and raising new hatchlings. Visitors from all over the world come to observe them. In addition to the birds on the island, Sandhill Cranes wander the grass, Black-bellied Whistling Ducks are often seen in a nearby grassy area, and Common Gallinules swim in a nearby pond. Blue-gray Gnatcatchers, Palm Warblers, and Yellow-rumped Warblers can be seen in the trees, and Osprey fly overhead. 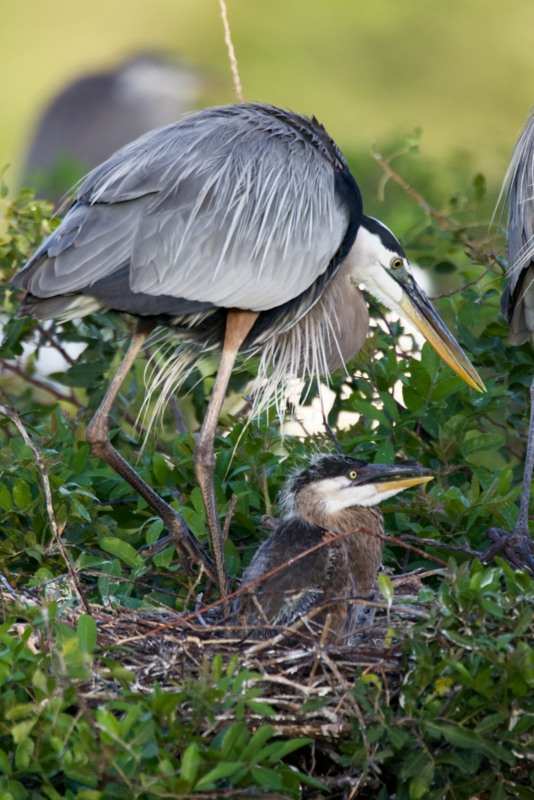 The Rookery is part of the Great Florida Birding Trail and has been reviewed by several national birding publications as an excellent location for birding and photography. It’s well worth visiting. You would have a hard time finding another place where you could see so many birds so close. A trip report from Talkin' Birds Ambassador George Dokes. While watching a Snowy Egret foraging for food along with eight other birders from the Arkansas Audubon Society at Lake Saracen, Pine Bluff, Arkansas this morning, we also spotted two Least Sandpipers, a few Double-Crested Cormorants, a Bald Eagle, a Great Blue Heron and a Belted Kingfisher. I told the group about Ray Brown's Talkin' Birds — Birding Ambassador doing my part. Shout out to my birding mentors Delos McCauley and Doc and John Redmon.